But there are still differences that can make or break your decision. We suggest you discuss your options with your sweetie. What if she's expecting a diamond and you give her a moissanite? It might be a beautiful ring, but she may feel slighted. Learning about moissanite together can help you make the choice. Read on to learn about the differences between diamonds and moissanites. This guide will help you decide which is right for you. Moissanite is a gemstone originally discovered in a meteor crater. So it's literally a space rock. Moissanite looks a lot like a diamond. They're both clear and sparkly. But moissanite is not a fake diamond and shouldn't be thought as one. It's a beautiful gemstone in its own right. Because of how much a moissanite looks like a diamond, it has become the most popular diamond alternative. Did you know: Moissinate was discovered in Arizona by Dr. Ferdinand Henri Moissan (hence the name) over 100 years ago. Only a tiny bit of it was found. It is so rare that all the moissanite we have today is lab grown. Moissanite is a naturally occurring silicon carbide. Silicon carbide is the compound of silicon and carbon. Its chemical name is SiC. SiC is characterized by high strength and exceptional hardness. Durability: Moissanite rates 9.25 on the Mohs Scale of Hardness. It's second only to diamonds (which have a rating of 10). They're both hard enough for everyday wear, and won't scratch or break easily. Sparkle: Both are beloved for their beautiful sparkles. But some astute observers can tell a difference. Moissanites usually have more of a rainbow sparkle, while diamonds emit a combination of colorless sparkle, rainbow sparkle, and flashes of light. Both are beautiful. What you like is your personal choice. Cut: Both diamonds and moissanites are available in a variety of shapes. But round is the most popular for both choices. The round brilliant cut offers the most sparkle and appears the most white. They are lot less expensive than diamonds: For example, you can get a 1-carat, colorless moissanite for $600. Even a near-colorless, 1-carat diamond costs around $5,000. The price of moissanite depends on size and if they were enhanced or not. Enhanced moissanite means it has gone through a process to make it whiter. Otherwise, moissanite tends to have a yellower tint. 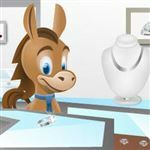 Some department stores or your local jeweler may sell moissanite rings. Before you go shopping, research moissanite prices on Brilliant Earth to get an idea of how much moissanite costs. Extreme brilliance: Moissanites are very sparkly. They have a high refractive index. This creates a greater sparkle than that of a diamond. The sparkles are often rainbow colored rather than colorless. In short, you get a flashy ring. Better clarity: Moissanites are not sold unless the clarity grade is VS or above. This grade means that there are no visible flaws. Diamonds, on the other hand, can have flaws that can be seen with the naked eye. Ethically created: Unlike diamonds, moissanites aren't mined from the Earth. Moissanite is grown in a controlled lab environment. This eliminates the worry of unfair labor practices and warfare. They also have a smaller carbon footprint. All of these reasons make moissanites an eco-friendly choice for an engagement ring. How to clean your moissanite ring: Dust and oils from regular wear may dull your moissy ring. Cleaning it is simple. Soak it in a bowl of mild soap and water and gently scrub the stone with a toothbrush. Rinse and either towel dry or air dry. Diamonds are pure carbon crystals. They take millions of years to form. They make up the most durable, natural substance available. Diamonds are a girl's best friend: Society has taught us that diamonds are the ultimate symbol of love. Some women may not think that another gemstone is a good substitute. White sparkle: Diamonds have a beautiful white sparkle. Moissanite, on the other hand, gives off more rainbow sparkles. Some people think it looks "fake" and is the tell-tale sign that the stone isn't a diamond. Tip: For a diamond that sparkles the most, buy one with an ideal cut. It can be handed down as an heirloom. Diamonds are valuable and moissanite isn't. 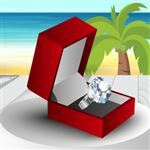 The diamond ring can be passed down to future generations as a precious piece of jewelry. Moissanite's value is mostly sentimental. 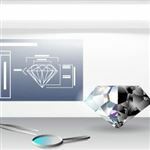 We want you to understand the possible downsides of both diamonds and moissanites. Taking the good with the bad, you can make the right decision for you and your loved one. Visually the biggest difference between a moissanite and a diamond is that a moissanite has more fire than a diamond (rainbow flashes of light). In stones under 5 mm (aprox .50 carat), this isn't that noticeable, but the bigger the stone gets, the more noticeable the fire is. The larger the stone, the more you will see the difference between a moissanite and a diamond. Moissanite is not a diamond. 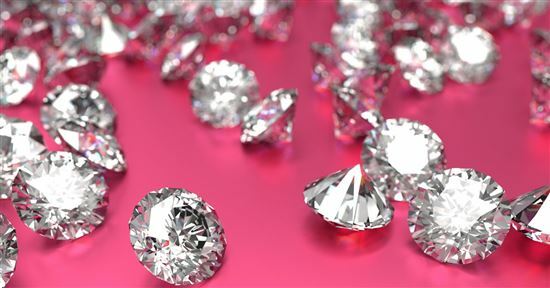 If your sweetie expects a diamond, she may be disappointed. If you want to save some money, discuss it with her first. Tip: Whatever you do, do not try to pass off a moissanite as a real diamond. She'll find out sooner or later. There may be a tint. Moissanite stones are usually slightly warmer toned (equivalent to near-colorless diamonds). Some people also report seeing a yellow or green cast to their moissys. If you're worried about this, get an enhanced moissanite, especially for stones 1 carat and over. Tip: Charles & Colvard's Forever One™ Colorless Moissanites are truly a game-changer. They are costly. You may only be able to buy a smaller rock because of the cost of diamonds. But you can buy a larger moissanite for a fraction of the cost of a smaller diamond. Did you know? Diamonds cost so much because the diamond cartel controls the supply and price. But in reality, they're not rare at all. A diamond miner in Africa only makes a few bucks for the several thousand dollar sparkler on her finger. Moissanite, on the other hand, costs closer to the actual value. They aren't always ethical. Unless you know how to find a conflict-free diamond, your diamond could have blood on it. Even if it doesn't, it could be mined from somewhere with unfair labor practices and unsafe working conditions. Charles & Colvard: They are the original creators of moissanite. They're dedicated to creating brilliant gems in an environmentally and socially responsible way. They offer their special Forever One™ Moissanite in colorless and near-colorless grades. Brilliant Earth: Brilliant Earth's principles go beyond being merely conflict-free. All their items are sourced from ethical mines with fair wages and labor practices. Cubic zirconia: CZs are always colorless and flawless. To the average person, it's hard to tell the difference between them and diamonds. Like moissanite, they tend to emit more of a rainbow sparkle. CZs are very inexpensive too - you can find a 1-carat CZ for $20. But they're literally cheap fake diamonds, so you and your sweetie must be on the same page about this. White sapphires: Sapphire is a precious gemstone suitable for engagement rings. However, white sapphires tend to look a little cloudy (i.e. not completely clear). They also don't emit any fire or scintillation, thus they're not as sparkly as a diamond. But being that it is quite hard, it can be worn daily. The cost is around $800 a carat. White topaz: If you're on a tiny budget but still want a real gemstone, consider white topaz. But beware: it's softer so it scratches more easily, which could make it look cloudy and less brilliant. It also doesn't have the kind of sparkle a diamond has. White topaz is very inexpensive- about the same price as CZs. Moissanite has properties very close to diamonds. Moissanite scores 9.25 on the Mohs Scale of Hardness. That makes it the hardest gemstone used in jewelry next to diamonds (which is a 10). Sparkle wise, moissanite has an even higher refractive index than diamonds, so it's even sparklier than a diamond. But it has more of a rainbow sparkle, whereas diamonds has both white and rainbow. Moissanite can also resist heat just as well as diamonds. In short - moissanite is a beautiful, brilliant stone that will hold up to everyday wear. If asking whether moissanite is good enough for your engagement ring, that's up to personal preference. Some girls love the savings and the intense sparkle, while others only want a real diamond. Can you tell the difference between a diamond and moissanite? Most people cannot tell that a moissanite is not a diamond. Maybe if you had the two side by side, a very keen observer can see that they are slightly different. Maybe you can see that the moissanite has more rainbow sparkles. Or that they have different casts of color under different lighting conditions. But even then, the casual person may not be able to say which one is which. In fact, even professionals have a hard time telling them apart, unless they use a special moissanite tester. Yes, just like diamonds, a moissanite stone will last for the rest of your life. It is very durable and will hold up to everyday wear and tear. Moissanite will also not lose brilliance or get cloudy over time. Just make sure you choose a durable setting as well in gold or platinum (like you would with a diamond). Don't use sterling silver plated in gold or platinum. That is not sturdy enough to last. Moissanite is closest to a diamond in terms of durability and brilliance. But please don't think of moissanite as a "fake diamond." It is a REAL gemstone that just happens to look a lot like diamonds. The fact that it's just a fraction of the cost is a huge plus. Should you choose moissanite for the engagement ring? It's truly a personal choice. There's no law that says an engagement ring must be a diamond. All that matters is that you like it. If you are on a budget, but want the look of a diamond, in our opinion, moissanite is the best. Don't think of it as a fake diamond. It's a beautiful gem in its own right. Tip: If you want a real diamond, do your research. You may be able to find a perfectly affordable diamond ring that fits your budget. We encourage you to take your time and do your homework. Talk to your sweetie and together decide what will bring the most joy to your marriage. In the end, it's about what the two of you want.